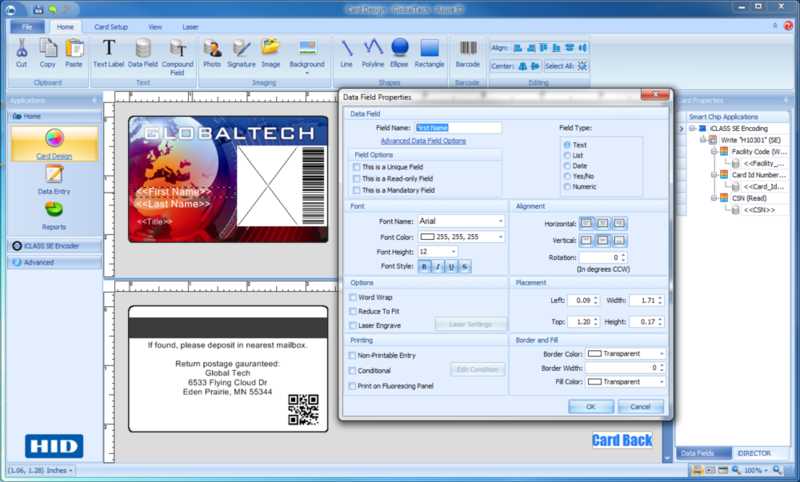 Asure ID Express is the ideal choice for organizations looking for an affordable and even easy-to-use stand alone photo ID card software with advanced card design and batch printing capabilities. Additionally, Asure ID 7 is built on the Microsoft .NET technology platform for greater stability and interoperability. Asure ID Express has additional features like compound data fields, batch printing, conditional design and print rules, and password protection. As your business needs grow, simply upgrade to Asure ID Enterprise or Exchange to add functionality. Improved User Interface - Asure ID Express has a user-friendly interface has a similar look-and-feel to the familiar Microsoft® Ribbon, allowing you to design and manage the creation of sharp photo IDs with minimal training. Databases Demystified - Asure ID Express comes with a configurable Live Link plug-in, making it easy to print cards from other databases, such as Microsoft Access®. Simplified Printer Functions - With Asure ID Express, now you can design and print cards without having to open and configure complicated printer drivers. Robust Reporting Suite - Asure ID Express enables you to filter, sort, and group data as needed to build custom reports that meet the needs of your business. Low Maintenance – Asure ID Express has built-in notifications about free software updates to ensure that the software is never outdated. We will follow up shortly with additional information.